The first release in two years on Matt Edwards` Dr Who name-checking Pyramids Of Mars.“Bahadir” translates from Turkish as “Brave, valiant, hero”, the track itself is static amplified. Insignificance recognized as significant, the devil in the detail, the sound of Pole and Echospace. A bass drum is scratched in, the resulting vibrations echoing into infinity, like a small section of QV`s Deep Space mix of Mudd`s “Speilplatz” electron magnified. “Untitled” pounds a tribal rhythm the bars of which are inhabited by snatches of haunting, ethereal female vocal that swirl and chase like smoke about the stone pillars of a forgotten temple. Benedictine spectres reaching out to a colder, darker future. I have no doubt that this will be absolutely massive on big system. 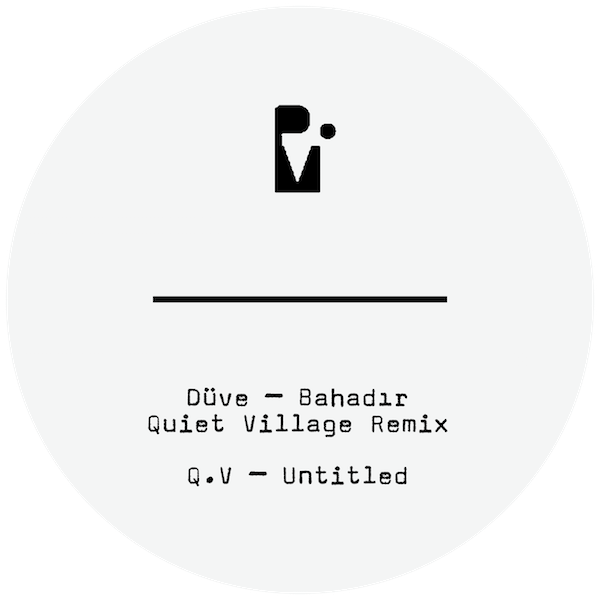 “Düve – Bahadir (Quiet Village Remix) / Quiet Village – Untitled” will be released on 13th November as a limited edition clear vinyl 10″.